In 1904 Messrs Workman and Clark, a Belfast shipyard, was commissioned by the Allan Line Steamship Company of Glasgow, to build the the ‘TSS Victorian’ which was the first passenger carrying, turbine driven, transatlantic liner. 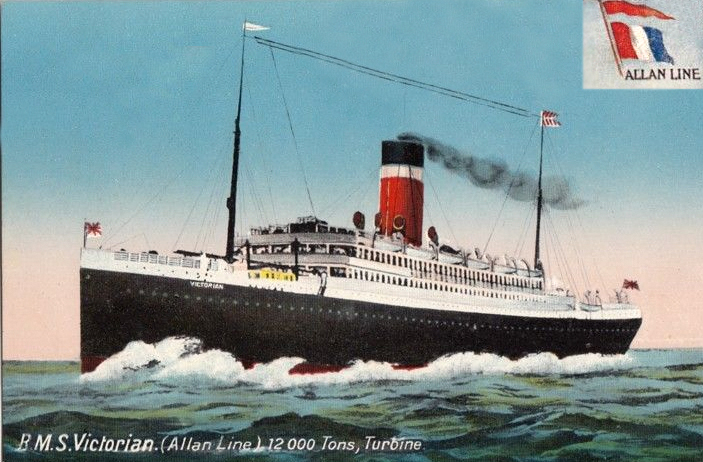 At that time the Allan Line was the world’s largest privately owned shipping company. The ‘Victorian’ was launched on 25th August 1904 and its maiden voyage was on 23rd March 1905, from Liverpool, England to St. John, New Brunswick. Powered by Parsons’ steam turbines it was the first steamer with triple propellers and at a speed of 18 knots (20mph/33kmh) was one of the fastest steamers afloat. Lilian Bland visited Messrs Workman and Clark at the time she was designing “The Mayfly”. This article, in draft form, is in her Aviation Workbook. Riveters, Milling and a Delightful Room. I propose in this short article to give a brief and untechnical account of a ship building yard. Hundreds of landlubbers like myself must often have admired the beautiful lines of the ocean greyhounds, or watched the tramps and merchantmen ploughing their way along the thoroughfares of the sea without giving a thought to the life and being of the ship itself. A few days ago I was shown over the yards of Messrs Workman and Clark, the well known ship builders of Belfast and my friend who was manager for them, gave me a general idea of the work. To start with the A.B.Cs. An owner wants a ship built. He gives a rough idea of what he requires, speed and tonnage, and sends this out to various yards for an estimate. This estimate varies sometimes in hundreds of pounds and sometimes there will only be a five pound sterling (7 euro) difference between two firms. We will suppose however that we are looking at an estimate from this firm. Everything about the ship, inside and out, will be in detail. This document will be sent to the owner who perhaps stipulates certain things and makes alterations. Then the contract is signed and the building starts on paper in the drawing office. I was shown a wonderful calculating machine which gives the moment, inertia and stability of the ship traced out. Inertia, as the man neatly explained is “If you were standing up in a railway carriage and the train stopped, you would sit back in your seat” i.e. the power of a ship to resist the waves. Stability, is the angle at which a ship can heel over without turning turtle. Stability varies with the amount of coal, cargo etc. The next step takes place in the moulding loft which is over 200 feet (61 m) long and 70 feet (21 m) wide. 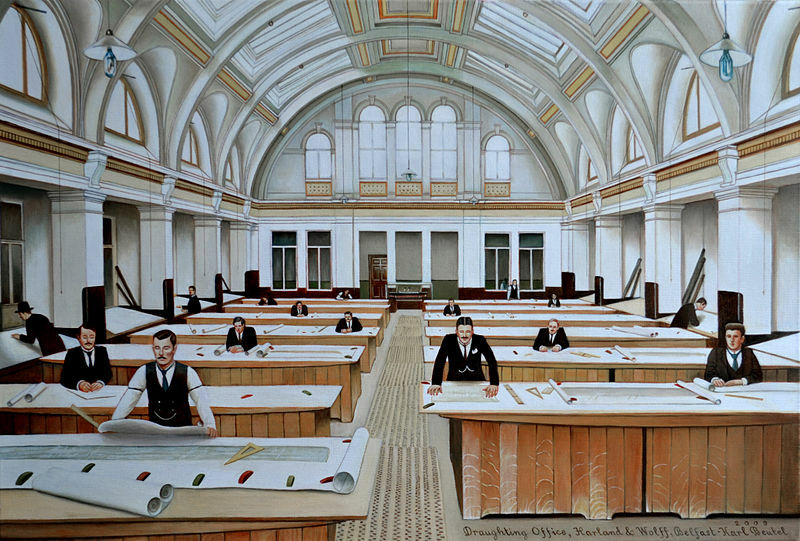 Here the lines plan of the drawing office is transferred to a full size plan by the shipwright loftmen and the practical department begins actual work. 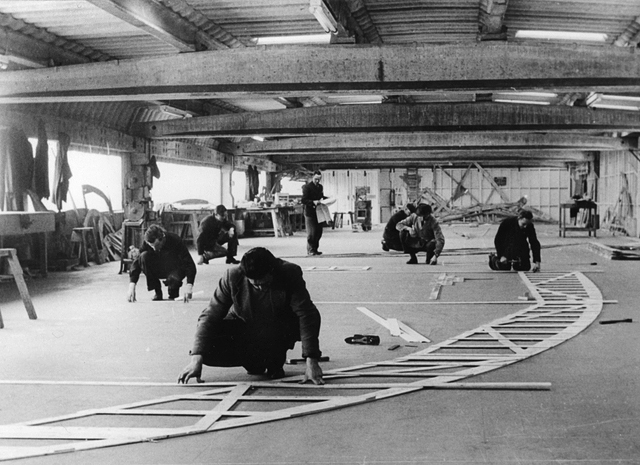 Long lathes of wood are pinned down on the floor to represent the skeleton of the ship and when all the lines correspond and are ‘true’, they are transferred as templates to the plater’s shed for the fabrication of the steel work. Then a delightful room is the model makers shop. Each vessel having been modelled exactly to scale before the actual construction commences. All over the yard and houses are lines along which the small cranes run since the keel plate of a vessel is laid. The cranes work in a line on the keel, running up and down the ship. The amount of ships are confusing to an amateur but everywhere one sees labour saving machines worked from the power station by electricity and steam. Punching, planing, hydraulic riveters, milling etc. One set of mills is over thirty feet (9 m) long and is capable of milling and bending cold plates 1.5 inches (3.8 cm) thick. The tip cutter weighs about forty tons (40,000 kg). Close to the furnaces which are heated by gas, is a large bevelling machine. As the frame bars leave the furnace, they are bevelled to the required angles. In every ship one sees ingenious machines and the amount of time (which means money) and labour saved is incalculable. Every detail of the ship, from the engines to the carpentery and decorating work, is finished in the yard. The works are divided into two sections on the North and South side of the river Lagan which runs into Belfast Lough. On each side there are sheds for platers, frame-setters, blacksmiths, fitters, joiners, painters, riveters etc. 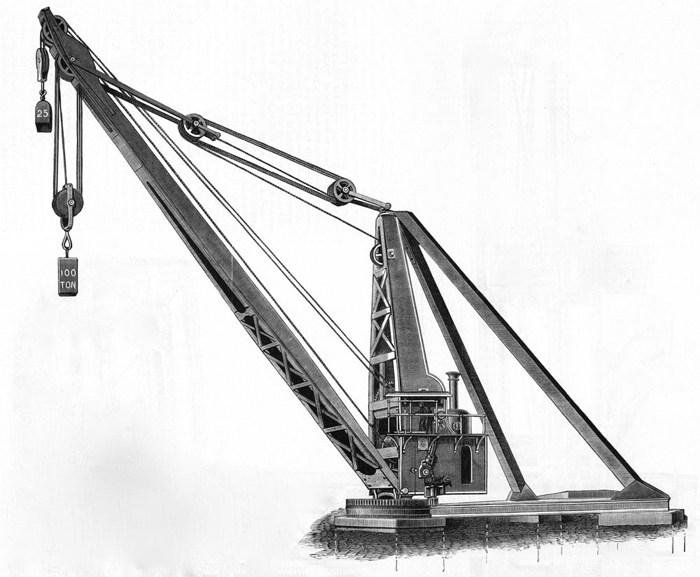 A broad guage railway (5ft 3in) (1600 mm) runs through the yard connecting it with local rail systems and a narrow guage line connects each of the ships with the slips. There are five building slips, each of which is capable of dealing with the largest vessels. Alongside each slip are placed large derricks about 120 feet (36.5 m) high, for lifting heavy weights aboard the steamers when in course of construction. The vessels are launched using an hydraulic system. The impression one had walking through the various sheds was one of immense power, the machines smoothly relentless in the charge of pygmy mortals, silently punching holes through sheets of iron as if it were soft cheese, rivets driven through boilers, melted through like a snowflake. Each workman solely occupied with the monster in his charge, contributing his small share of labour towards the grey skeletel monster on the slips which, after many months of labour, will glide gracefully down to the sea. There is little doubt that the turbine is destined to supersede the marine engine because it offers increased speed, reduced weight, better reliability and complete lack of vibration. The ‘Victorian’ will carry 1,300 passengers and will be driven at a speed of 18 knots by three propellers, powered by one high-pressure and two low-pressure Parson’s turbines. The side propellers are worked by the low-pressure turbines, and can be driven at full speed foward or astern, either together or independently, which will give the ‘Victorian’ maximum manoeuvrability. The Allan Line brought more young immigrants to Canada than any other line.